Dark. Empty. Silent. This is deep space. . .and vicious Aliens are attacking. One force has the guns and the guts to face these ugly monsters. Send in the heavy metal. . .Send in the Space Marines! The invasion is on! Attacking Double Jaws…Whipping Spiked Tail! Grabbing Claw and Flapping Wings! (with Backpack Torpedo Launcher) Specialty: Tracker Home Planet: Tanaka 5 Background: Sixth sense for hunting out the aliens, strong survival instinct! Quote: "I don't always like what I find. . .
(with Extending Capture Claw) Specialty: Tactician Home Planet: KR 37, Polvar System Background: as led numerous inter-planetary missions, familiar with all known weaponary & terrains Quote: &quo. 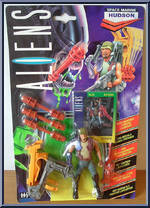 . .
Vasquez comes with the famous M41-A Pulse Rifle. This itself can be a feature for many Aliens enthusists. She was only released in European markets. 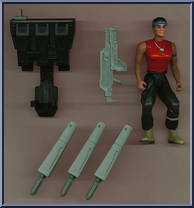 Vasquez also came with a missile launcher pack that. . .